2 Officially recognised languages: In addition to English (whose use is established by precedent), Scottish Gaelic has the status of being officially developed to become "an official language of Scotland commanding equal respect to the English language" since 2005 Act. Edinburgh, the nation's capital and second largest city, is one of Europe's largest financial centres. 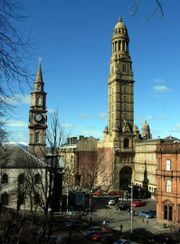 Scotland's largest city is Glasgow, which is the centre of the Greater Glasgow conurbation. Greater Glasgow is home to approximately 40% of Scotland's population. Scottish waters consist of a large sector of the North Atlantic and the North Sea, containing the largest oil reserves in the European Union. The Kingdom of Scotland was an independent state until 1 May 1707, when the Acts of Union resulted in a political union with the Kingdom of England to create the Kingdom of Great Britain. Scotland's legal system continues to be separate from those of England, Wales and Northern Ireland, therefore Scotland still constitutes a discrete jurisdiction in public and in private international law. The continued independence of Scots law, the Scottish education system and the Church of Scotland have been three cornerstones contributing to the continuation of Scottish culture and Scottish national identity since the Union. However, Scotland is no longer a sovereign state and does not enjoy direct membership of either the United Nations or the European Union. The word Scotia was used by the Romans as the name of one of the tribes in what is now Scotland as early as the 1st Century AD. The Romans also used Scotia to refer to the Irish. The Venerable Bede (c. 672 or 673 – May 27, 735) uses the word "Scottorum" as the name of a nation from Ireland who settled part of the Pictish lands. "Scottorum nationem in Pictorum parte recipit." This we can infer to be the arrival of the people, also known as the Gaels, in the Kingdom of Dál Riata, in the Western edge of Scotland. It is of note that Bede used the word "nationem" ( nation) where he often refers to other peoples, such as the Picts, as "gens" (race). In the 10th century Anglo Saxon Chronicle, the word Scot is mentioned as a reference to the 'Land of the Gaels'. Word Scottorum was again used, by an Irish King, in 1005. The phrase Imperator Scottorum, was used after the name of Brian Bóruma, by his notary Mael Suthain, in the Book of Armagh. It is thought to imply that Brian Bóruma was overlord of the Scots. The style was subsequently copied by the Scottish kings. Basileus Scottorum is attributed to the great seal of King Edgar (1074 – 1107). Alexander I (c. 1078 – 1124) used the words Rex Scottorum on his great seal; So to did many of his successors up to and including James II.. In modern times the words "Scot" and "Scottish" are applied mainly to inhabitants of Scotland. The ancient Irish connotations are largely forgotten. The language known as Ulster Scots, spoken in parts of North East Ireland, arose through 17th and 18th century immigrations from Scotland to Ireland. Skara Brae, a neolithic settlement, is located in the Bay of Skaill on the west coast of mainland Orkney. Prior to the Mesolithic period, Scotland was repeatedly glaciated. The ice covered the entire land mass of Scotland and so has destroyed any evidence of early human habitation. The earliest Scottish human settlement, dated to around 8500 BC, was found at Cramond, near Edinburgh. A well preserved Neolithic farmstead can been seen at Knap of Howar on Orkney. The building, dated to around 3500 BC, is claimed to be the oldest standing house in the country. An example of a complete Neolithic village can be seen nearby at the village of Skara Brae, on the Mainland of Orkney. There are many other Neolithic habitation, burial and ritual sites across the Northern and Western Isles such as Callanish on Lewis, Maeshowe and The Ring of Brodgar on Orkney. In southern, crannogs were a common form of dwelling. After the 8th century BC, Brythonic Celtic culture and language spread into Scotland. The Iron age brought numerous hill forts, brochs, crannogs and fortified settlements which support the image of quarrelsome tribes and petty kingdoms later recorded by the Romans, though evidence that at times occupants neglected the defences might suggest that symbolic power had as much significance as warfare. The written histories of Scotland began with the arrival of the Roman Empire. The Romans occupied what is now England and Wales. Parts of southern Scotland were controlled by Rome for brief periods as well. The Roman historian, Tacitus, calls Northern Scotland Caledonia. The name derives from one of the many Pictish tribes in the region who were called the Caledonii. In 1603, Elizabeth I of England died. Thus James VI King of Scotland also became King James I of England. With the exception of a short period under The Protectorate, Scotland remained a separate state. There was considerable conflict between the crown and the Covenanters over the form of church government. After the Glorious Revolution and the overthrow of the Roman Catholic James VII by William and Mary, Scotland briefly threatened to select a different Protestant monarch from that of England. The Alien Act of 1705 was a law passed by the Parliament of England, in 1705, as a response to the Parliament of Scotland's Act of Security of 1704, which in turn was a response to the English Act of Settlement 1701. The Alien Act provided that estates held by Scottish nationals in England were to be treated as alien property, making inheritance much less certain. It also had an embargo on the import of Scottish products into England and English colonies - about half of Scotland's trade, covering sectors such as linen, cattle and coal. The Act contained a provision that it would be suspended if the Scots entered into negotiations on the dispute between the two parliaments. Combined with English financial offers to refund Scottish losses on the Darién scheme, it achieved its aim, leading to the Act of Union 1707 uniting the two countries as the Kingdom of Great Britain. The deposed Jacobite Stuart claimants had remained popular in the Highlands and north-east, particularly amongst non- Presbyterians. Two major Jacobite risings launched from the Highlands of Scotland in 1715 and 1745. The latter uprising was lead by Bonnie Prince Charlie, aka "The Young Pretender". It climaxed with the defeat of the Jacobites at the Battle of Culloden on 16 April 1746. During the Scottish Enlightenment and the Industrial Revolution, Scotland became one of the commercial, intellectual and industrial powerhouses of Europe. After World War II, Scotland experienced an industrial decline. The Royal Arms of Queen Elizabeth II in Scotland. A version without the helm is used by the Scottish Executive. As one of the constituent countries of the United Kingdom, the head of state in Scotland is the British monarch, currently Queen Elizabeth II (since 1952). Constitutionally the United Kingdom is a unitary state with one sovereign parliament and government. Under a system of devolution (or home rule) adopted after Scottish and Welsh referendums on devolution proposals in 1997, most of the constituent countries within the United Kingdom were given limited self-government, (except England). The British Parliament in Westminster retains the ability to amend, change, broaden or abolish the devolved governmental systems at will. As such the Scottish Parliament is not sovereign. However, it is thought unlikely that any British parliament would unilaterally abolish a home rule parliament and government without consultation via a referendum with the voters of the constituent country. Executive power in the United Kingdom is vested in the Queen-in-Council, while legislative power is vested in the Queen-in-Parliament (the Crown and the Parliament of the United Kingdom at Westminster in London). Under devolution executive and legislative powers in certain areas have been constitutionally delegated to the Scottish Executive and the Scottish Parliament at Holyrood in Edinburgh respectively. The United Kingdom Parliament retains active power over Scotland's taxes, social security system, the military, international relations, broadcasting, and some other areas explicitly specified in the Scotland Act 1998 as reserved matters. The Scottish Parliament has legislative authority for all other areas relating to Scotland, and has limited power to vary income tax, but has never exercised this power. The Scottish Parliament can refer devolved matters back to Westminster to be considered as part of United Kingdom-wide legislation by passing a Legislative Consent Motion if United Kingdom-wide legislation is considered to be more appropriate for certain issues. The programmes of legislation enacted by the Scottish Parliament have seen a divergence in the provision of public services compared to the rest of the United Kingdom. For instance, the costs of a university education, and care services for the elderly are free at point of use in Scotland, while fees are paid in the rest of the UK. Scotland is the first country in the UK to ban smoking in public places. The Scottish Parliament is a unicameral legislature comprised of 129 Members, 73 of whom represent individual constituencies and are elected on a first past the post system; 56 are elected in eight different electoral regions by the additional member system, first elected on the 6th May 1999 and serving for a four year period. The Queen appoints one of the members of the Parliament, on the nomination of the Parliament, to be First Minister. Other Ministers are also appointed by the Queen on the nomination of the Parliament and together with the First Minister they make up Scottish Executive, the executive arm of government. The current (since 2001) First Minister is Jack McConnell of the Labour Party, who forms the government on a coalition basis with the Liberal Democrats. The main opposition party is the Scottish National Party, which campaigns for Scottish independence. Other parties include the Conservative and Unionist Party, the Scottish Green Party and the Scottish Socialist Party. Scotland is represented in the British House of Commons by 59 MPs elected from territory-based Scottish constituencies. The Scotland Office, a department of the United Kingdom government led by The Secretary of State for Scotland, is responsible for reserved matters. The Secretary of State for Scotland sits in the Cabinet of the United Kingdom and prior to devolution headed the system of government in Scotland. The current Secretary of State for Scotland is Douglas Alexander. Until 1999, Scottish peers were entitled to sit in the House of Lords. Political debate in Scotland has revolved around the constitution and this dominated the Scottish political scene in the latter half of the 20th century. Under the pressure of growing support for Scottish independence all three UK-wide parties advocated a policy of devolution to some degree during their history (although Labour and the Conservatives have also at times opposed it). Now that devolution has occurred, debate continues over whether the Scottish Parliament should accrue additional powers (for example over fiscal policy), or seek to obtain full independence with full sovereign powers (either through independence, a federal United Kingdom or a confederal arrangement). It remains to be seen whether the current devolution system satisfies Scottish demands for self-government or will strengthen demands for full-blown independence. Scots law has a basis derived from Roman law combining features of both uncodified civil law, dating back to the Corpus Juris Civilis, and common law with mediaeval sources. The terms of the Treaty of Union with England in 1707, guaranteed the continued existence of a separate legal system in Scotland from that of England and Wales. Prior to 1611, there were several regional law systems in Scotland, most notably Udal Law in Orkney and Shetland — based on Old Norse Law. Various other systems derived from common Celtic or Brehon Laws survived in the Highlands until the 1800s. Scots law provides for three types of courts responsible for the administration of justice in Scotland: civil, criminal and heraldic. The supreme civil court is the Court of Session, although civil appeals can be taken to the House of Lords in London. The High Court of Justiciary is the supreme criminal court. Both courts are housed at Parliament House, Edinburgh which was the home of the pre-Union Parliament of Scotland. The sheriff court is the main criminal and civil court. There are 49 sheriff courts throughout the country. District courts were introduced in 1975 for minor offences. The Court of the Lord Lyon regulates heraldry in Scotland. Historical subdivisions of Scotland include the mormaerdom, stewartry, earldom, burgh, parish, county and regions and districts. The names of these areas are still used as geographical descriptors. Modern Scotland is subdivided in different ways depending on the purpose. For local government, 32 council areas were set up in 1996. These are administered by 32 unitary authorities responsible for the provision of all local government services, including education, social work, environment and roads services. Some of the larger councils are further divided into area committees. Community councils are informal organisations that represent specific sub-divisions of a council area. There are 35 lieutenancy areas, for which the Queen appoints a Lord Lieutenant to represent her (except for Glasgow, Edinburgh, Dundee and Aberdeen — where the democratically elected Lord Provost is the Lord Lieutenant, ex officio). There are six sheriffdoms for administering justice. For the Scottish Parliament, there are 8 regions. These are then sub-divided into 73 constituencies. For the Parliament of the United Kingdom there are 59 constituencies. The Scottish fire brigades and police forces are still based on the system of regions introduced in 1975. For healthcare and postal districts, amongst others, Scotland is subdivided in various other ways. Non-governmental organisations, notably the churches, have other long-standing methods of subdividing Scotland for the purposes of administration. City status in the United Kingdom is determined by letters patent. There are six cities in Scotland: Aberdeen, Dundee, Edinburgh, Glasgow, Inverness, and Stirling. 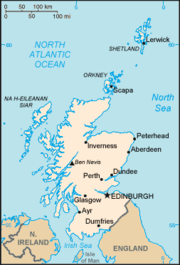 Scotland comprises the northern third of the island of Great Britain, off the coast of north west Europe. The total land mass is around 78,772 square kilometres (30,414 mi²). Scotland's only land border is with England, and runs for 96 kilometres (60 miles) between the River Tweed on the east coast and the Solway Firth in the west. The island of Ireland lies around 30 kilometres (20 mi) off the south west tip of Scotland, Norway is around 400 kilometres (250 mi) to the north east, and the Faroes and Iceland lie to the north. Scotland lies between the Atlantic Ocean and the North Sea. The territorial extent of Scotland is generally that established by the 1237 Treaty of York between Scotland and England and the 1266 Treaty of Perth between Scotland and Norway. Exceptions include the Isle of Man, which is now a crown dependency outside the United Kingdom, Orkney and Shetland, which are Scottish rather than Norwegian, and Berwick-upon-Tweed, which was defined as subject to the laws of England by the 1746 Wales and Berwick Act. Rockall was annexed by the United Kingdom in 1972 and administratively made part of the Isle of Harris in Scotland, although this is disputed by the Republic of Ireland, Iceland, and Denmark; both the UK (in 1997) and Ireland (in 1996) have since ratified the United Nations Convention on the Law of the Sea, which excludes Rockall from qualifying as land from which various territorial limits can be measured although it is claimed by both the UK and Ireland that it lies within their territorial limits. The country consists of a mainland area plus several island groups. The mainland can be divided into three areas: the Highlands in the north; the Central Belt and the Southern Uplands in the south. The Highlands are generally mountainous and are bisected by the Great Glen. The highest mountains in the British Isles are found here, including Ben Nevis, the highest peak at 1,344 metres (4,409 ft). All mountains over 3,000 ft (914 m) are known as Munros. The Central Belt of Scotland is generally flat and is where most of the population reside. The Central Belt is often divided into the West, which contains the areas around Glasgow; and the East which includes the areas around the capital, Edinburgh. The Southern Uplands are a range of hills and mountains almost 200 km (125 miles) long, stretching from Stranraer by the Irish Sea to East Lothian and the North Sea. Scotland has over 790 islands, divided into four main groups: Shetland, Orkney, and the Hebrides, divided into the Inner Hebrides and Outer Hebrides. The Firth of Clyde and the Firth of Forth also contain many islands. St. Kilda is the most remote of all the inhabitable Scottish islands, being over 160 km (100 miles) from the mainland. Almost all the islands surrounding Scotland, no matter how small or remote, were formerly inhabited, as is shown by archaeological and documentary evidence. In general only the more accessible and larger islands retain human populations (though these are in some cases very small). Access to several islands in the Northern and Western groups was made easier in the course of the 20th century by the construction of bridges or causeways (e.g., the Churchill Barriers), installed for strategic reasons during the Second World War between several small islands on the east side of Scapa Flow in Orkney. Plans, some controversial, for more links between islands continue to be drawn up. The climate of Scotland is temperate and oceanic, and tends to be very changeable. It is warmed by the Gulf Stream from the Atlantic, and as such has much milder winters (but cooler, wetter summers) than areas on similar latitudes, for example Oslo or Moscow. However, temperatures are generally lower than in the rest of the UK, with the coldest ever UK temperature of -27.2° C (-16.96° F) recorded at Braemar in the Grampian Mountains, on 11 February 1895 and 10 January 1982 and also at Altnaharra, Highland, on 30 December 1995. Winter maximums average 6°C (42.8°F) in the lowlands, with summer maximums averaging 18°C (64.4°F). The highest temperature recorded was 32.9°C (91.22°F) at Greycrook, Scottish Borders on 9 August 2003. In general, the west of Scotland is usually warmer than the east, due to the influence of the Atlantic ocean currents, and the colder surface temperatures of the North Sea. Tiree, in the Inner Hebrides, is the sunniest place in the country: it had 300 days of sunshine in 1975. Rainfall varies widely across Scotland. The western highlands of Scotland are the wettest place, with annual rainfall exceeding 3,000 mm (120 inches). In comparison, much of lowland Scotland receives less than 800 mm (31 inches) annually. Heavy snowfall is not common in the lowlands, but becomes more common with altitude. Braemar experiences an average of 59 snow days per year, while coastal areas have an average of less than 10 days. The Scottish economy is closely linked with that of the rest of Europe and the wider Western world, with a heavy emphasis on exporting. It is essentially a market economy with some government intervention. After the Industrial Revolution, the Scottish economy concentrated on heavy industry, dominated by the shipbuilding, coal mining and steel industries. Scotland was an integral component of the British Empire which allowed the Scottish economy to export its output throughout the world. Heavy industry declined, however, in the later part of the 20th century, leading to a remarkable shift in the economy of Scotland towards a technology and service sector-based economy. The 1980s saw an economic boom in the Silicon Glen corridor between Glasgow and Edinburgh, with many large technology firms relocating to Scotland. The discovery of North Sea oil in the 1970s also helped to transform the Scottish economy. Edinburgh is the financial services centre of Scotland and the sixth largest financial centre in Europe, with many large finance firms based there, including: the Royal Bank of Scotland Group (the second largest bank in Europe); HBOS (owners of the Bank of Scotland); Standard Life; and Scottish Widows. Glasgow is Scotland's leading seaport and is the fourth largest manufacturing centre in the UK, accounting for well over 60% of Scotland's manufactured exports. Shipbuilding, although significantly diminished from its heights in the early 20th century, still forms a large part of the city's manufacturing base. 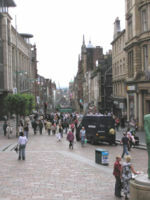 The city also has Scotland's largest and most economically important commerce and retail district. Glasgow is also one of Europe's top 20 financial centres and is home to many of the UK's leading companies. Aberdeen, sometimes referred to as the Oil Capital of Europe, is the centre of the North Sea oil industry. Other important industries include textile production, chemicals, distilling, brewing, fishing and tourism. Only about one quarter of the land is under cultivation (principally in cereals and vegetables), but sheep farming is important in the less arable highland and island regions. Most land is concentrated in relatively few hands (some 350 people own about half the land). As a result, in 2003, the Scottish Parliament passed a Land Reform Act that empowered tenant farmers and local communities to purchase land even if the landlord did not want to sell. Scotland's North Sea oil platforms tap into the largest oil reserves in the European Union. In 2004, total Scottish exports (excluding intra-UK trade) were provisionally estimated to be £16.7 billion, of which 73% (£12.19 billion) were attributable to manufacturing. The largest export products for Scotland are niche products such as whisky, electronics and financial services. The largest markets were the United States, Germany, and The Netherlands. In 2002, the Gross Domestic Product (GDP) of Scotland was just over £74 billion ($130 billion), giving a per capita GDP of £14,651 ($25,546). Although the Bank of England is the central bank for the UK, three Scottish clearing banks still issue their own Sterling banknotes: the Bank of Scotland; the Royal Bank of Scotland; and the Clydesdale Bank. These notes have no status as legal tender in England, Wales, or Northern Ireland, although they are fungible with the Bank of England banknotes. Despite this, Scottish-issued notes are often refused in England and they are not always accepted by banks and exchange bureaus outside the UK. The current value of the Scottish banknotes in circulation is around £2.5 billion. Although Scotland has a long military tradition that predates the Act of Union with England, its armed forces now form part of the British Armed Forces. In 2006, the regiments of the Scottish Division were amalgamated to form the Royal Regiment of Scotland. Due to their topography and perceived remoteness, parts of Scotland have housed many sensitive defence establishments, with mixed public feelings. Between 1960 and 1991, the Holy Loch was a base for the U.S. fleet of Polaris ballistic missile submarines. Today, Her Majesty's Naval Base Clyde, 25 miles (40 km) west of Glasgow, is the base for the four Trident-armed Vanguard class ballistic missile submarines that comprise the UK's nuclear deterrent. HMS Caledonia at Rosyth in Fife is the support base for navy operations in Scotland and also serves as the Naval Regional Office (NRO Scotland and Northern Ireland). The Royal Navy's submarine nuclear reactor development establishment, is located at Dounreay, which was also the site of the UK's fast breeder nuclear reactor programme. HMS Gannet is a search and rescue station based at Prestwick Airport in Ayrshire and operates three Sea King Mk 5 helicopters. RM Condor at Arbroath, Angus is home to 45 Commando, Royal Marines. Three important Royal Air Force bases are in Scotland today. These are RAF Lossiemouth, the RAF's primary base for the Panavia Tornado GR4 strike aircraft, RAF Kinloss, home to the Nimrod maritime patrol aircraft and RAF Leuchars, the most northerly air defence fighter base in the United Kingdom. The only open air live depleted uranium weapons test range in the British Isles is located near Dundrennan. As a result, over 7000 radioactive munitions lie on the seabed of the Solway Firth. This has led to many environmental concerns. The large amount of military bases in Scotland has led some to use the euphemism "Fortress Scotland". In 2004, the MoD land holdings in Scotland (owned, leased or with legal rights) was 115,200 hectares representing around 31% of the MoD's UK estate. People on Buchanan Street in Glasgow. The population of Scotland in the 2001 census was 5,062,011. This has risen to 5,094,800 according to July 2005 estimates. This would make Scotland the 112th largest country by population if it were a sovereign state. Although Edinburgh is the capital of Scotland it is not the largest city; Scotland's largest city, with a population of 629,501, is Glasgow. The highest concentration of population in Scotland is in the areas surrounding Glasgow with approximately 2.2 million people living in west central Scotland centred on the Greater Glasgow urban conurbation. Due to immigration since World War II, Glasgow, Edinburgh and Dundee have significant Asian and Scottish Asian populations. Since the recent Enlargement of the European Union there has been an increased number of people from Central and Eastern Europe moving to Scotland. For example, Aleksander Dietkow, Consul General of Poland, estimates that there are between 40,000 and 50,000 Poles living in Scotland. As of 2003, there are 16,315 Chinese people in Scotland and 18.2% of international students at Scottish Universities come from China, making them the largest international student group in Scotland. Since the United Kingdom lacks a codified constitution, there is no official language. However, Scotland has three officially recognised languages: English, Scottish Gaelic and Scots. De facto English is the main language, and almost all Scots speak Scottish Standard English. 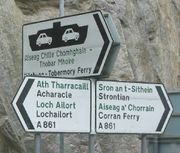 Over the past century the number of native speakers of Gaelic, a Celtic sister language to Irish, has declined from around 5% to just 1% of the population, almost always on a fully bilingual basis with English. Gaelic is mostly spoken in the Western Isles, where the local council uses the Gaelic name - Comhairle nan Eilean Siar ("Council of the Western Isles"). The General Register Office for Scotland estimates that 30% of the population are fluent in Scots, a West Germanic sister language to English. Scots and Gaelic were recognised under the European Charter for Regional or Minority Languages ratified by the UK in 2001, and the Scottish Executive is committed, based on the UK's undertakings, to providing support for both Under the Gaelic Language (Scotland) Act 2005 which was passed by the Scottish Parliament to provide a statutory basis for a limited range of Gaelic language service provision, English and Gaelic receive "equal respect" but do not have equal legal status. State support for Scots is slowly growing with the Scottish Executive providing some funding to various Scots language projects and bodies, including the Dictionary of the Scots Language. The ruins of the Cathedral of St Andrew in St Andrews, Fife. The Church of Scotland, also sometimes popularly known as The Kirk, is the national church and has a Presbyterian system of church government. It is not subject to state control nor is it " established" as is the Church of England within England. It was formally recognised as independent of the UK Parliament by the Church of Scotland Act 1921, settling centuries of dispute between church and state over jurisdiction in spiritual matters. The Scottish Reformation, initiated in 1560 and led by John Knox, was Calvinist, and throughout the 17th and 18th centuries, the Church of Scotland maintained this theology and kept a tight control over the morality of much of the population. The Church had a significant influence on the cultural development of Scotland in early modern times. Other Christian denominations in Scotland include the Free Church of Scotland, an off-shoot from the Church of Scotland adhering to a more conservative style of Calvinism, the Scottish Episcopal Church, which forms part of the Anglican Communion, the Methodists, the Congregationalists, and The Church of Jesus Christ of Latter-day Saints. Roman Catholicism in Scotland survived the Reformation, especially on islands like Uist and Barra, despite the suppression of the 16th to the late 18th centuries. Roman Catholicism was strengthened particularly in the west of Scotland during the 19th century by immigration from Ireland. This continued for much of the 20th century, during which significant numbers of Catholics from Italy and Poland also migrated to Scotland. Much of Scotland (particularly the West Central Belt around Glasgow) has experienced problems caused by sectarianism, particularly football rivalry between the traditionally Roman Catholic team, Celtic, and the traditionally Protestant team, Rangers. Islam is the largest non-Christian religion in Scotland (estimated population, 50,000) despite accounting for less than 1% of the population. There are also significant Jewish and Sikh communities, especially in Glasgow. At 28% of the population, Scotland has a relatively high proportion of persons who regard themselves as belonging to 'no religion'. Indeed, this was the second most common response in the 2001 census. The education system in Scotland is distinct from the rest of the United Kingdom and was the first country since Sparta in classical Greece to implement a system of general public education. The early roots were in the Education Act of 1496 which first introduced compulsory education for the eldest sons of nobles. Then, in 1561, the principle of general public education was set with the Reformation establishment of the national Kirk which set out a national programme for spiritual reform, including a school in every parish. Education finally came under the control of the state rather than the Church and became compulsory for all children from the implementation of the Education Act of 1872 onwards. As a result, for over two hundred years Scotland had a higher percentage of its population educated at primary, secondary and tertiary levels than any other country in Europe. The differences in education have manifested themselves in different ways, but most noticeably in the number of Scots who went on to become leaders in their fields and at the forefront of innovation and discovery leading to many Scottish inventions during the 18th and 19th centuries. Today, children in Scotland sit Standard Grade exams at the age of 15 or 16, sometimes earlier, for up to eight subjects (although some schools study for nine) including compulsory exams in English, mathematics, a foreign language, a science subject and a social subject. Each school may vary these compulsory combinations. The school leaving age is 16, after which students may choose to remain at school and study for Access, Intermediate or Higher Grade and Advanced Higher exams. A small number of students at certain private, independent schools may follow the English system and study towards GCSEs instead of Standard Grades, and towards A and AS-Levels instead of Higher Grade and Advanced Higher exams. 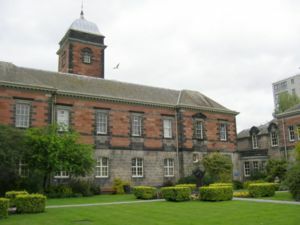 The Geddes Quadrangle of University of Dundee. The Scottish Executive funds over forty further and higher education colleges where students can study for more vocational qualifications; degree-entry qualifications such as diplomas; and specialist courses in the arts or agriculture. Scotland has 13 universities and one university college, including the four ancient universities of Aberdeen, Edinburgh, Glasgow and St Andrews founded during the mediaeval period. Bachelor's degrees at Scottish universities are bestowed after four years of study, with the option to graduate with an ordinary degree after three years or continue with the fourth year of study to obtain an honours degree. Unlike the rest of the United Kingdom, Scottish students studying at a Scottish university do not have to pay for tuition fees. The Students Awards Agency for Scotland (SAAS) pay course fees for all Scottish students domiciled in Scotland and offer bursaries to eligible students. Scottish students have the option of accepting a loan from the Student Loans Company (SLC), and if eligible, this is paid back after graduation. Scottish students studying outside of Scotland but within the UK have to pay for tuition, but at a reduced rate depending upon how much their chosen institution charges. All Scottish universities attract a high percentage of overseas students, and many have links with overseas institutions. The culture of Scotland, although heavily influenced by that of neighbouring England is distinct and internationally recognised. Scotland has its own arts scene with both music and literature heavily influenced by unique Scottish sources and some Scottish sporting traditions are unique to the British Isles. Scottish cuisine has much in common with others in the UK, but has distinctive attributes and recipes of its own, thanks to foreign and local influences both ancient and modern. Traditional dishes exist alongside international foods brought by immigration and a Scottish public eager to try new dishes. The national food of Scotland is Haggis, which consists of minced offal, spices, suet and oatmeal, stuffed and cooked in a sheep's stomach. Pheasant is also attributed to Scotland along with many other types of game. Scottish cuisine is enjoying a renaissance, with a number of Michelin star restaurants operating in the country, serving traditional or fusion Scottish cuisine made with local ingredients. In most towns, Chinese and Indian take-away restaurants exist side-by-side with traditional fish and chip shops; larger towns and cities offer cuisine ranging from Thai and Japanese to Mexican. The Scottish music scene is a significant aspect of Scottish culture, with both traditional and modern influences. An example of a traditional Scottish instrument is the Great Highland Bagpipe, a wind instrument consisting of one or more musical pipes which are fed continuously by a reservoir of air in a bag. The Clàrsach, fiddle and accordion are also traditional Scottish instruments, the latter two heavily featured in Scottish country dance bands. Scottish emigrants took traditional Scottish music with them and it influenced early local styles such as country music in North America. Today, there are many successful Scottish bands and individual artists in varying styles. Scottish literature includes literature written in English, Scottish Gaelic, Scots, Brythonic, French, Latin and any other language in which a piece of literature was ever written within the boundaries of modern Scotland. Some of the earliest literature known to have been composed in Scotland dates from the 6th century and includes Y Gododdin written in Brythonic (Old Welsh) and the Elegy for St Columba by Dallan Forgaill written in Middle Irish. Vita Columbae by Adomnán, the ninth Abbot of Iona, was written in Latin during the 7th century. In the 13th century, French flourished as a literary language long before Early Scots texts appeared in the fourteenth century. After the 17th century, anglicisation increased, though Lowland Scots was still spoken by the vast majority of the population of the Lowlands. The poet and songwriter Robert Burns wrote in the Scots language, although much of his writing is also in English and in a "light" Scots dialect which would have been accessible to a wider audience than simply Scottish people. The introduction of the movement known as the " kailyard tradition" at the end of the 19th century, brought elements of fantasy and folklore back into fashion. J. M. Barrie provides a good example of this mix of modernity and nostalgia. This tradition has been viewed as a major stumbling block for Scottish literature, focusing, as it did, on an idealised, pastoral picture of Scottish culture, becoming increasingly removed from reality of life in Scotland during that period. Some modern novelists such as Irvine Welsh, (of Trainspotting fame), write in a distinctly Scottish English that reflects the underbelly of contemporary Scottish culture. Scotland has its own national governing bodies, such as the Scottish Football Association (the second oldest national football association in the world) and the Scottish Rugby Union; and its own national sporting competitions. As such, Scotland enjoys independent representation at many international sporting events such as the FIFA World Cup, the Rugby World Cup and the Commonwealth Games; although notably not the Olympic Games. Variations of football have been played in Scotland for centuries with the earliest reference being in 1424. Association football is now the national sport but earlier versions such as the ba game are still played. Scotland hosted the first ever international rugby union match in 1871 and 20 months later followed with the first ever international association football match. Both were played against England with the rugby union side winning and the association side drawing. The Scottish Cup is the world's oldest national trophy. The famous Old Course at St Andrews is an example of a links golf course found in coastal areas of Scotland. The Fife town of St Andrews is known internationally as the Home of Golf. To many people, the Old Course at St Andrews, an ancient links course dating to before 1574, may be considered a site of pilgrimage. There are many other famous golf courses in Scotland, including Carnoustie, Gleneagles, Muirfield and Royal Troon. Other distinctive features of the national sporting culture include the Highland Games, curling and shinty. Kingussie Camanachd, the dominant shinty team, is recognised by Guinness World Records as the most successful sporting club team in the world. Scotland has several ski resorts. These are Cairn Gorm, Glen Coe, Glen Shee, The Lecht, and Nevis Range. Scotland also hosts snowboarding and most other winter sports. Scotland has four main international airports ( Glasgow, Edinburgh, Prestwick and Aberdeen) that serve a wide variety of European and intercontinental routes with scheduled and chartered flights. Highland and Islands Airports operate 10 regional airports serving the more remote locations of Scotland. There is technically no national airline, however various airlines have their base in Scotland including Loganair (operates as a franchise of British Airways), Flyglobespan, City Star Airlines, Air Scotland and ScotAirways. Scotland has a large and expanding rail network, which, following the Railways Act of 2005, is now managed independently from the rest of the UK. The East Coast and West Coast Main Railway lines and the Cross Country Line connect the major cities and towns of Scotland with the English network. First ScotRail operate services within Scotland. The Scottish Executive has pursued a policy of building new railway lines, and reopening closed ones. Operators to English destinations include First ScotRail, GNER and Virgin Trains. The Scottish motorways and major trunk roads are managed by the Scottish Executive. The rest of the road network is managed by the Scottish local authorities in each of their areas. The country's busiest motorway is the M8 which runs from the outskirts of Edinburgh to central Glasgow, and on to Renfrewshire. The Flag of Scotland, the Saltire or St Andrew's Cross, dates (at least in legend) from the 9th century, and is thus the oldest national flag still in use, and it can be found flying all over Scotland. The Saltire now also forms part of the design of the Union Flag. The Royal Standard of Scotland, a banner showing the Royal Arms of Scotland, is also frequently to be seen, particularly at sporting events involving a Scottish team. Often called the Lion Rampant (after its chief heraldic device), it is technically the property of the monarch and its use by anybody else is illegal, although this is almost universally ignored, and never enforced. The unicorn is also used as a heraldic symbol of Scotland. The Royal Coat of Arms of Scotland, used prior to 1603 by the Kings of Scotland, incorporated a lion rampant shield supported by two unicorns. 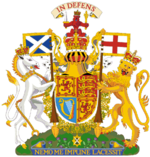 On the Union of the Crowns, the Arms were quartered with those of England and Ireland, and one unicorn was replaced by a lion (the supporters of England). William Wallace, a national hero and a leader in the Scottish Wars of Independence. The thistle, the floral emblem of Scotland, features in many Scottish symbols and logos, and on UK currency. Heather is also considered to be a symbol of Scotland. Flower of Scotland is popularly held to be the National Anthem of Scotland, and is played at international events such as football or rugby matches involving the Scotland national team. However, since devolution, more serious discussion of a national anthem has led to this being disputed. Other candidates include Scots Wha Hae, Scotland the Brave and A Man's A Man for A' That. St Andrew's Day, the 30th of November, is the national day, although Burns' Night tends to be more widely observed. 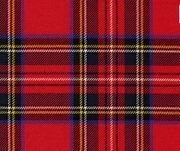 Tartan Day is a recent innovation from Canada. There is currently a campaign within the Scottish Parliament to create a national holiday on Saint Andrew's Day.